Malware refers to specially designed malicious software that covertly runs on a compromised website without the approval of the owner or administrator. Malware is a broader term for various types of malicious programs namely, the computer virus, worm, ransomware, spyware, and more. The sole purpose for creating a website malware is for stealing data, credentials, payment information, etc. Website malware focused on this type of theft can be extremely costly to the website’s credibility that falls a prey to the attack. When such odd things happen – only a website malware removal can help steer clear from the danger. In order to prevent a disaster, the following suggestions can help mitigate the damage done by a malware attack. In order to protect the website from malware attacks, it is important to educate the users on best practices for avoiding malware. Regular, unannounced exercises, for instance, voluntary phishing campaigns, can help keep users become more vigilant and learn more on security awareness training. All computer in the network should be installed with a suitable A/V solution which is more capable of detecting and removing malware when it is required. It is mandatory to maintain it up-to-date with the vendor’s latest definitions/signatures. In order to secure a website, it is equally important to secure the network as well. Deploy proven technology and methodologies like using a firewall, IPS, IDS, and remote access only through VPN. Scanning the websites regularly for vulnerabilities to detect if known malware has been installed can keep the website secure, protect your users, and protect customers. Regularly run back up to stay safe from a destructive virus or ransomware attack and stressful, frantic scrambling with costly downtime/data-loss. Website Malware takes on many different forms and attacks in different ways however this approach will help you steer clear of the danger. Besides these valuable suggestions, few process improvements, careful preparations and by educating users, a website’s safety can be attained against malware attacks. Over the past few years, website malware attacks have witnessed a sharp rise and have drawn the attention of everyone. Malware is the general term for several variants, and almost all malware variants are used for malicious activities by hackers. The website scanning can check a website for malware and reveal the hidden malware. Usually, malware infects a website through phishing emails, malicious online advertising that contain malware payload, and software downloads from untrusted sources. As always, prevention is better than cure. If you have a good security solution and run frequent backups, you shouldn’t have any problems. Besides that, check your website for malware activity. Comodo Web Inspector is one of the best website malware removal tools that can track all the mentioned hiccups that websites face during attacks. 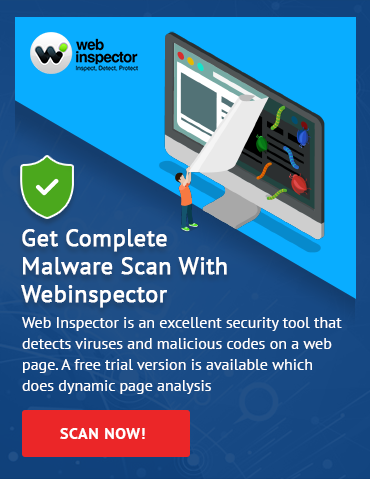 How to check your website for malware using Comodo Web Inspector? For more details about Comodo Web Inspector, visit our official page.